Increasing rents and purchase prices in major cities are the result of a constant, high rate of immigration from the surrounding areas and abroad. Berlin, Hamburg and Munich require thousands of new housing units every year. The full extent of the situation is illustrated by the new calculation of housing requirements by IW Cologne. The situation of the housing markets in German cities continues to be a tense one. Although the construction activity has picked up noticeably, the number of newly built housing units fails to meet the extremely high demand. 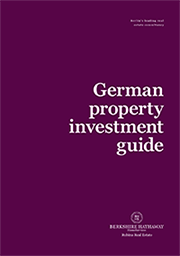 In total, Germany requires a total of 224.000 new housing units every year. In 2012, a mere 200.000 units were completed, which leaves a gap of 24.000 units. The regional demands vary depending on the demographic and economic development. Many large cities or cities with universities only have a small supply of housing units, so the rents and purchase prices increase. 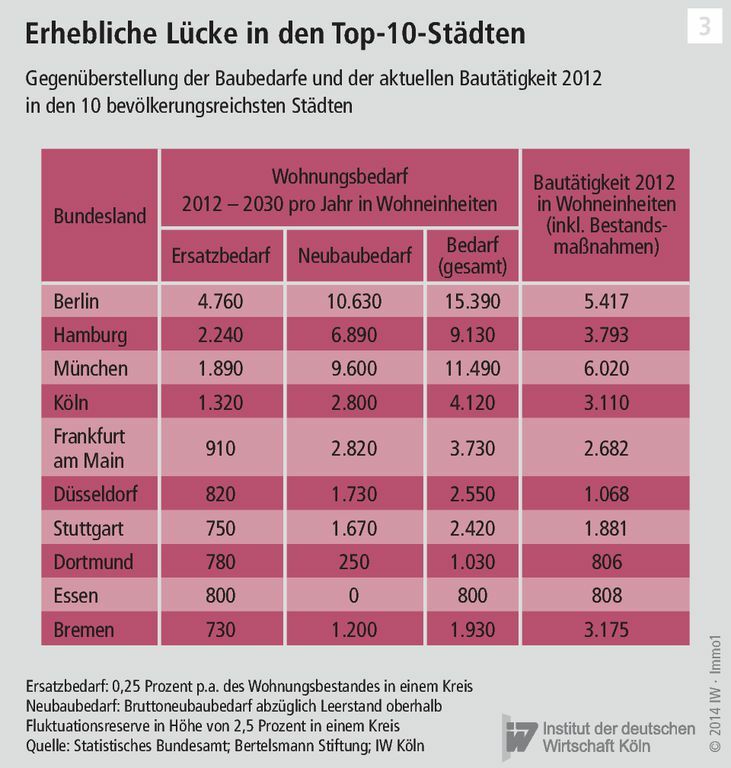 On the contrary, many German districts expect a population decline, which leads to many vacant units. How many housing units the individual cities actually require has now been calculated by IW Cologne. Berlin is at the top of the list with an annual requirement of roughly 15.000 new units, followed by Hamburg with 9.000 and Munich with 11.500 units per year. Cologne will require 4.000, Frankfurt Main 3.700 new units to meet the demands of the growing population. When comparing the number of required units to the number of recently completed units, the reason for the high pressure on the prices in the cities becomes obvious. 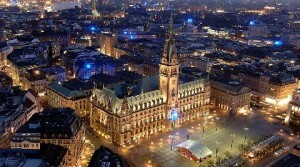 Bremen was the only city that succeeded in providing more new units than the requirement dictated. The construction activity in all major cities is well behind the estimated requirements. 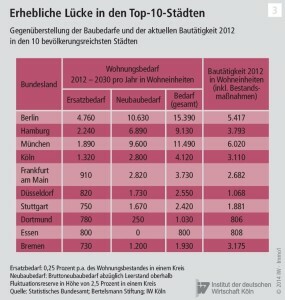 Berlin therefore lacks 10.000 units/year, Hamburg 5.300 and Munich 5.400. However, the number of granted construction permits in Berlin has risen to more than 13.000 in 2013, which closes the gap at least to a small extent. The necessity of replacement demands of the housing stock is the result of the economic wear and tear of occupied housing space. Loss of stock due to complete destruction of a unit is a rare occurrence; the majority of units can be refurbished or redeveloped and thus preserved. However, a certain loss cannot be prevented over the course of time. The calculations expect a replacement requirement of 0.25% of the housing stock for the year of 2011. Therefore, 2.5 units have to be built for every 1.000 existing units. Using Berlin with its stock of 1.9 million units as an example, that would amount to a replacement requirement of nearly 5.000 units per year. Although this appears to be a fairly large number at first glance it is plausible, because it does not only include units fit for demolition, but also units that have been merged or are used in a different way.